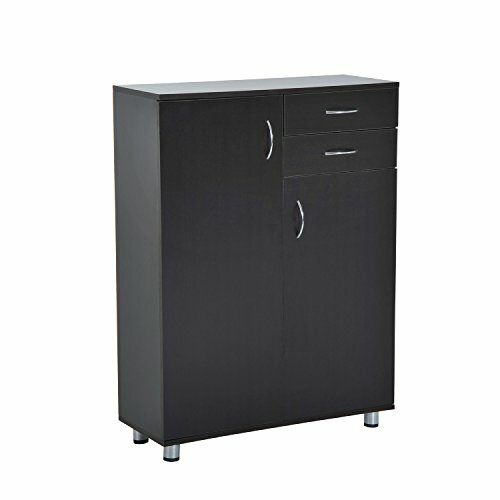 This HomCom contemporary shoe cabinet is a great solution to organize your shoes and save floor space at the same time. It features two drawers and one double-door cupboard giving you ample storage space to hold up to 16 pairs of shoes and organize small essentials such as keys and socks. Built with solid particle board in an attractive finish, this will be a great piece to make your home more comfortable and inviting! - Overall Size: 31.5""W x 12.5""D x 43.5""
-Tier Spacing (4 bottom lattice): 4.5""
- 4x Leg Diameter: 2.5""